Benazir Bhutto was assassinated December 27, 2007, weeks before a general election in Pakistan. As chairman of the United Nations Commission of Inquiry into the assassination, Heraldo Munoz can take the credit for putting a significant amount of information about the murder plot into the public domain. His work helped to establish that a 15-year-old Taliban recruit killed her. It is also clear now that the Pakistani state deliberately botched the investigation in a clumsy attempt to prevent more details emerging. After the assassination, Pakistani elections went ahead and a national wave of sympathy for Benazir Bhutto carried her Pakistan People's Party (PPP) into power. Her widower, Asif Ali Zardari, moved into the President's House. This gives rise to an unanswered question. Even if some elements of the state wanted to block an investigation into Benazir Bhutto's murder why didn't the new President show greater determination -- or indeed any determination -- to find out who killed his wife? Once Zardari had made all his key appointments to Pakistan's various intelligence agencies, placing PPP stalwarts in key posts, many of the new office holders expected their first task would be to investigate the murder. But it never happened. Some say they were blocked by Zardari's ultra-loyal Interior Minister, Rehman Malik. There were only two possible explanations for this surprising turn of events. First, Zardari had planned the murder and was seeking to protect himself. Many Pakistanis believe this but there is not a single piece of evidence backing the claim. The second and more convincing explanation is that Zardari calculated that he could not afford to expose the plot for fear of sharing his wife's fate. As Zardari once told me himself, he knew full well who killed his wife -- it was the Taliban -- the question was which elements of the Pakistani state asked them to do it. It is only fair to record that in this book Heraldo Munoz has pulled some punches. 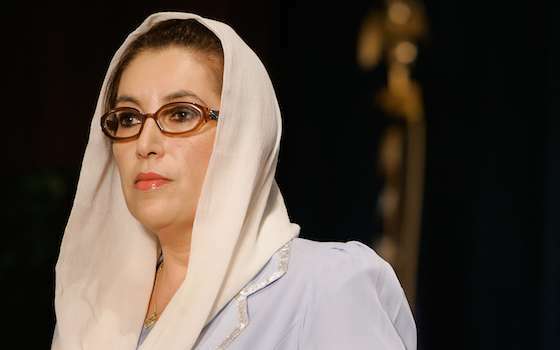 For example, rather than stating that the evidence of Benazir Bhutto's corruption is overwhelming, he merely makes a brief reference to the fact that she faced allegations. Yet on the central issue of who killed her, he has delivered more than could be expected of a UN official. Although identifying the culprits was not part of his formal UN brief, the author showed a willingness to delve into some murky waters. Most bureaucrats -- especially UN ones -- avoid controversy by interpreting their terms of reference as narrowly as possible. Munoz did the opposite. Nonetheless, the precedents in Pakistan were hardly encouraging. When he started his work Munoz knew full well that unsolved, high-profile conspiracies included the assassination of Pakistan's first Prime Minister Liaquat Ali Khan, the military dictator, Zia ul Haq and two of Benazir Bhutto's brothers. It was perhaps inevitable that even if he could name the teenage killer, Munoz could not solve the riddle of who ordered Benazir's death. His search for the truth, however, did reveal something of profound interest. Nobody, it seemed, wanted to help him. In life Benazir Bhutto was welcome in corridors of power all over the world. In death, she was an inconvenience. Pakistan's main intelligence agency, the Inter-Services Intelligence (ISI), blocked Munoz at every turn; simply refusing to hand over evidence, failing to answer his questions and even refusing to give him access to information about four people they said they had detained for alleged involvement in the murder plot. And it gets worse. In 2008, the CIA Director Michael Hayden said the Taliban had killed Bhutto with Al-Qaeda support. When the Commission asked for meetings with US intelligence officials to understand the basis for that statement, the US denied them access. Even Condoleezza Rice, the US Secretary of State, refused to see them. Since the United Arab Emirates, Saudi Arabia and Afghanistan had all tried to warn Bhutto that her life was in danger, the Commission wanted to follow those leads too. None of these countries was willing to share any useful information. The British behaved in a similar manner. When the Commission asked the Foreign Office what measures the UK had taken to ensure Bhutto's safe return to Pakistan, Munoz records: 'We were promised detailed answers but we never received them, despite repeated reminders on our part'. All of which leaves open the question: why was she killed? Munoz runs through some of the possible explanations. She was a pro-American, liberal woman with a history of antagonism towards the army and was clearly opposed to the Pakistani state policy of cultivating some jihadists. Maybe that was a factor. But there is another explanation that, surprisingly, Munoz does not mention. At the heart of Pakistan's deep state lies its nuclear programme. Bhutto had promised the Americans that, in the event of her winning the election, she would give the US access to the man who had built the bomb, A. Q. Khan. The fear that Khan would reveal the army's role in proliferating Pakistan's nuclear know-how surely provided a strong incentive for the deep state to get rid of her. That, of course, is speculation. And if you are thinking that this all sounds a bit too conspiratorial then consider this: days before her murder Bhutto sent General Musharraf, Pakistan's then president, an email naming four men who she said were a threat to her security. They were the former ISI director General Hamid Gul, the former head of the Intelligence Bureau Ijaz Shah and two powerful political opponents Pervez Elahi and Arbab Ghulam Rahim. And how did those men answer that allegation? We don't know because the Pakistani investigators never questioned them and the Commission could not get access to them. The deep state in Pakistan keeps its secrets.